Here is the Summer Schedule for our 2013 season. Just in case you were wondering gymnastics, tumbling and cheer is a year around sport. It is because there is so much to learn and experience. 2. I run a summer discount special for people when they go on vacation. Some people think that because you have a one week summer vacation planned in the middle of summer that you should take the whole summer off of gymnastics. Well you don’t need to. Let me know when you are going on vacation and I will take a week’s worth of tuition off for the month. No excuses now 😉 Just make sure you tell me before you go on vacation and pay your tuition. 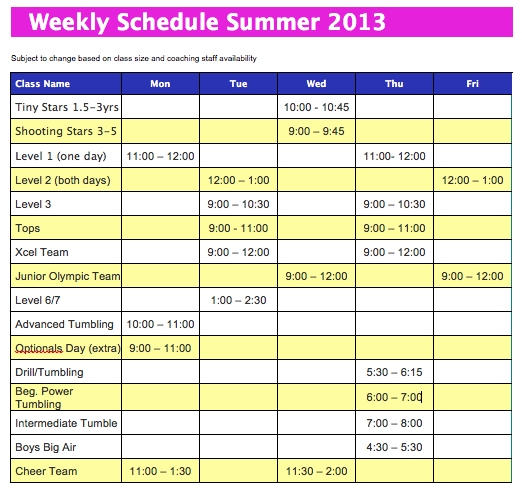 I have restructured the tumbling classes to have a beg, intermediate, and adv. class. Here’s how you know what class you’re in. The drill class will be mixed with the beginning tumbling class but any level can take it. When will you know if your child moves up a level? It will be announced to you through email sometime after the Parents day/Competition. What needs to happen before your child does move up? She/he needs to have completed the skills necessary to perform at the level they are in without a spot. This is to ensure that kids don’t move too fast. Most kids need a full year in each level before they advance to the next except for team (usually two years). That is the Fall, Spring, and summer sessions. However some kids will move earlier and some will move later than that. It just depends on what skills they have. Scores from the competition are taken into account as well. If you are in the gymnastics program and feel that you are not able to make it to the new schedule but still want to keep up with something you may opt to do our tumbling classes during the summer. That will allow for progression but not a full commitment until the fall season comes again. Many times if kids take the whole summer off and come back in the fall, they feel out of place and passed up by the group they worked with before. If you can avoid this, I highly recommend it. This schedule may be subject to change as we work out the coaching staff availability. Occasionally Some classes may be at a different time once during the week as we have coaches that go on trips and summer camps and have fewer coaches on staff. Please always check your emails. Xcel Gold level and JO level 6 and higher are required to come on Optionals day. Level 6 & 7 is also required to come on there extra day. This entry was posted in Uncategorized by Big Rock Gymnastics. Bookmark the permalink.